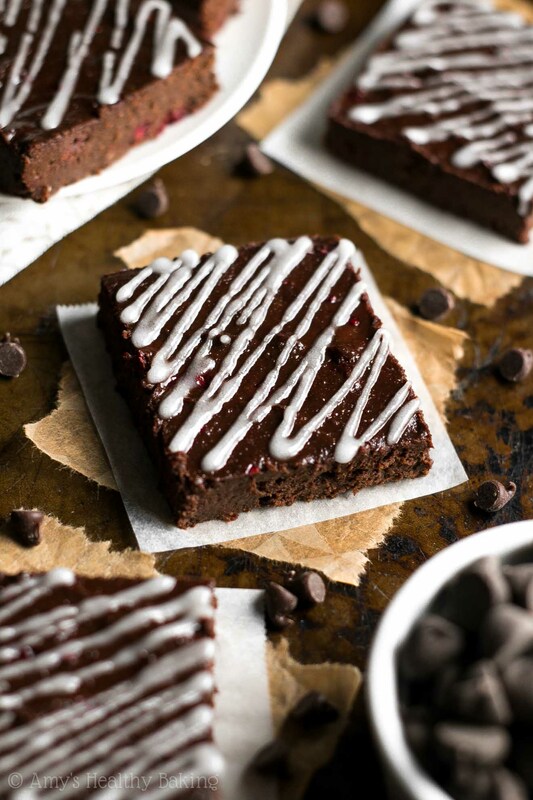 An easy recipe for decadent raspberry-studded brownies topped with a sweet almond drizzle. They’re incredibly rich—so nobody ever believes that they’re secretly healthy! Since California is currently experiencing an El Niño year (aka tons of rain—it falls nearly every day! ), I always check the weather both the night before and the morning of an outdoor run. Last Saturday, the weather website reported a 0% chance of rain until 2 pm, so I bundled up in my warmest fleece jacket and gloves before heading out the door. Less than 5 minutes into my warm-up walk, a very fine mist began falling. Remembering the weather report, I decided to wait it out, and I started my stopwatch for the 30-second intervals. As I sprinted around the neighborhood streets, the mist grew heavier, almost to the point of a light drizzle. And saw a huge rainbow stretching across the gray sky. My anger immediately melted—it’s impossible not to smile at the sight of a rainbow! All of those pretty pastel colors shining brightly after a storm… I like to think they’re a sign that good things are coming. 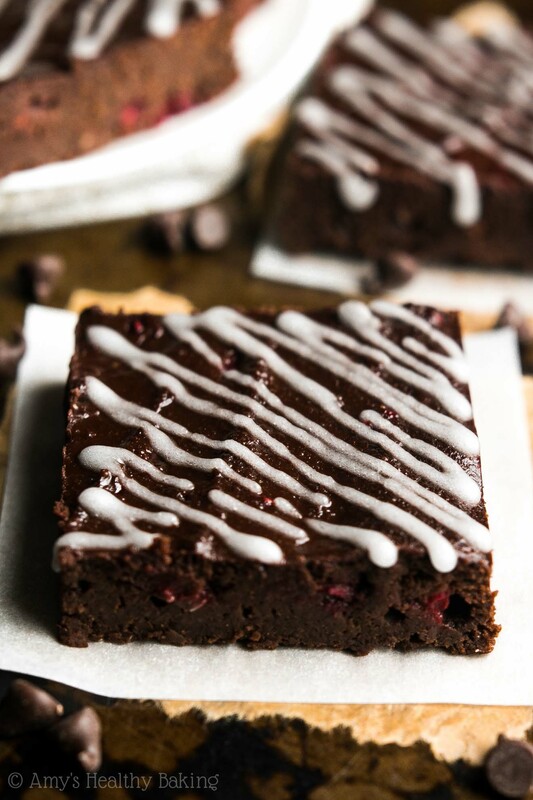 Besides, that workout reminded me of these Fudgy Dark Chocolate Raspberry Brownies that I had waiting for me back at home! And not just because I exercise to earn extra dessert… The decadent dark chocolaty part reminded me of the storm clouds, while the bright pop of fruity flavor from the raspberries resembled that stunning rainbow. Too much of a metaphor? Then let’s just dig into these delicious treats! 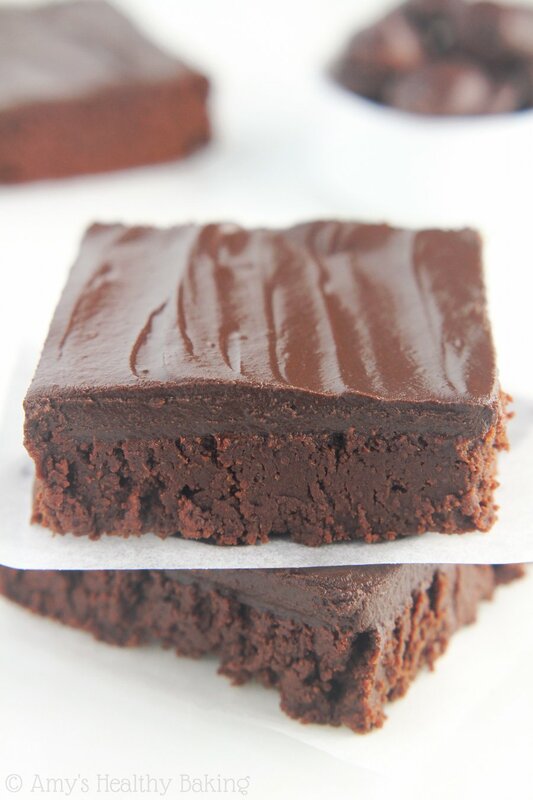 These healthier brownies begin with white whole wheat flour. White whole wheat flour comes from finely ground white wheat, whereas regular whole wheat flour is made from red wheat. This gives white whole wheat flour a lighter taste and texture, similar to that of all-purpose flour, but it still has the same health benefits as regular whole wheat flour. How’s that for a win-win?? Note: I included my preferred gluten-free flour blend in the Notes section beneath the recipe, if that better suits your diet! 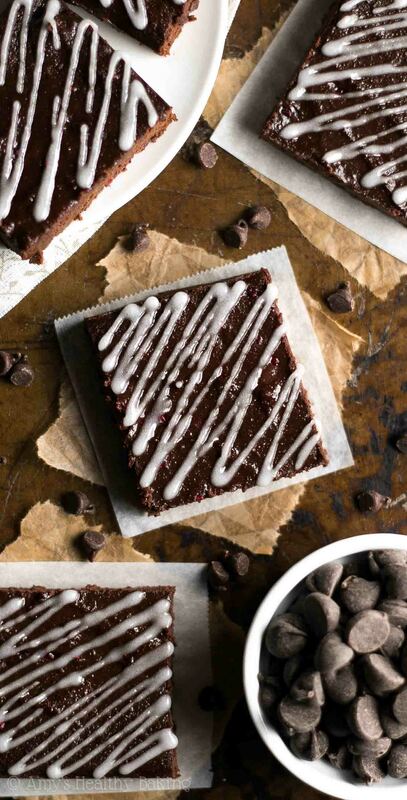 All of the rich chocolate flavor in these brownies comes from cocoa powder. Just the regular unsweetened kind! 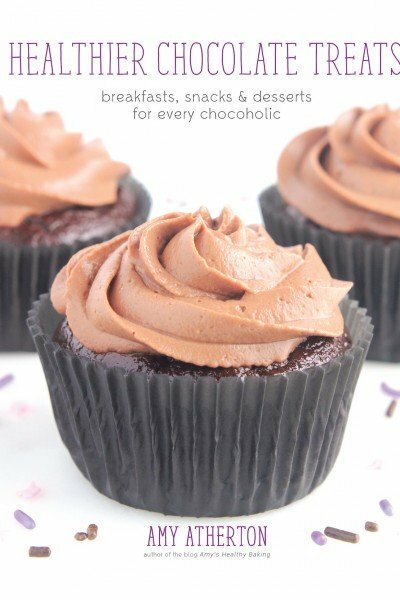 You don’t need Dutched or special dark cocoa powder (and I would actually caution you against substituting it! 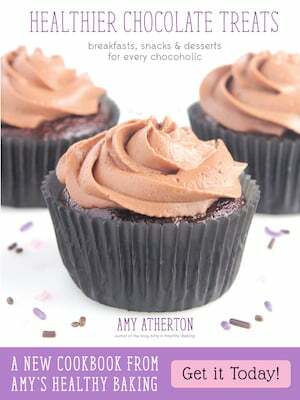 ), because you’ll add equal amounts of cocoa powder and flour to the batter. Yes, a full ¾ cup of cocoa powder! 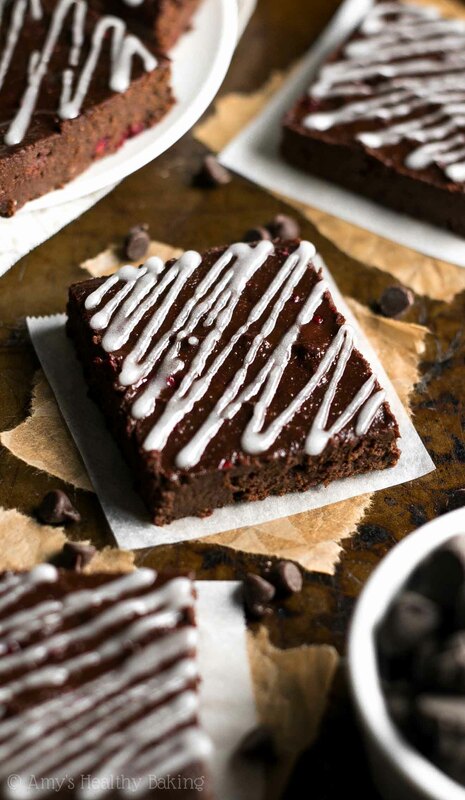 It gives these brownies an incredibly decadent flavor without the extra calories of melted chocolate. Many traditional brownie recipes call for a full stick or two of butter (yikes! ), but this healthier one requires just 2 tablespoons. 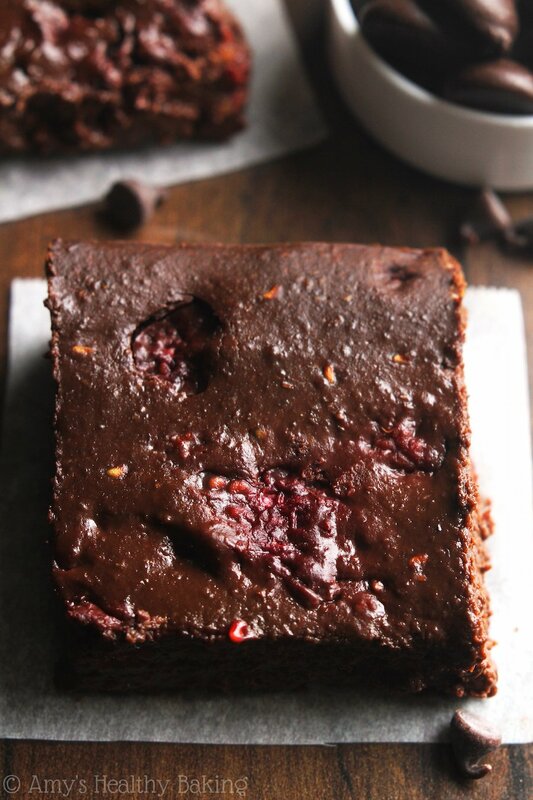 The rest of their fudgy texture comes from my favorite ingredient in healthier baking. If you’ve been around my blog for a while, you already know what it is… Greek yogurt! 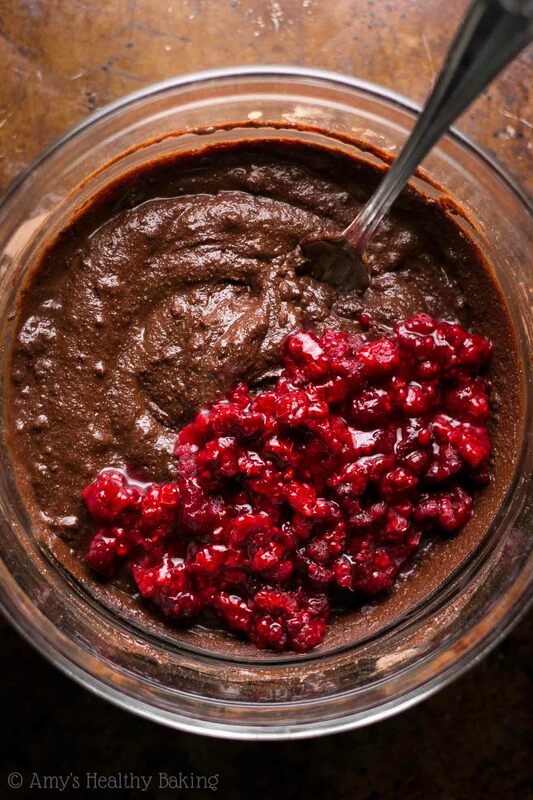 It provides the same moisture as extra butter or oil for a fraction of the calories, and it gives your baked goods a little protein boost, too. 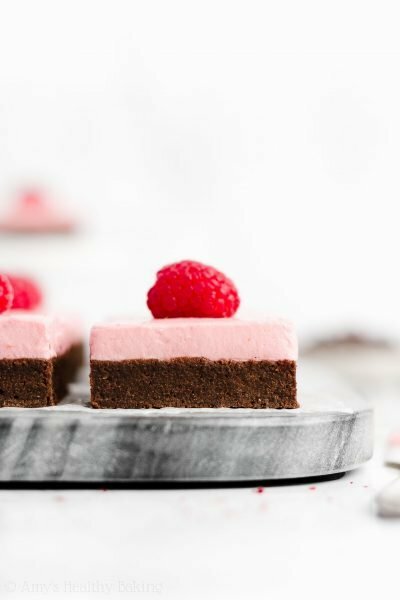 I opted to use frozen raspberries for these brownies so that you could easily make them all year round. (They’re perfect for Valentine’s Day, which is quickly approaching!) Fresh would also work, if you decide to try this recipe during the summer when raspberries are in season. Regardless of which kind you use, dice them before folding into the batter to ensure the brownies bake more evenly. To keep these brownies extremely fudgy, you’ll bake them at a fairly low temperature: just 300°F. They’re ready to come out of the oven when the sides look mostly done and the center still looks glossy. That center will continue to cook through as the brownies cool in the warm pan, and for the fudgiest texture, wait at least 3 hours to slice them into squares after the pan reaches room temperature. And when you make your own, remember to snap a picture and share it on Instagram using #amyshealthybaking and tagging @amyshealthybaking IN the photo itself! (That guarantees I’ll see your picture! ?) 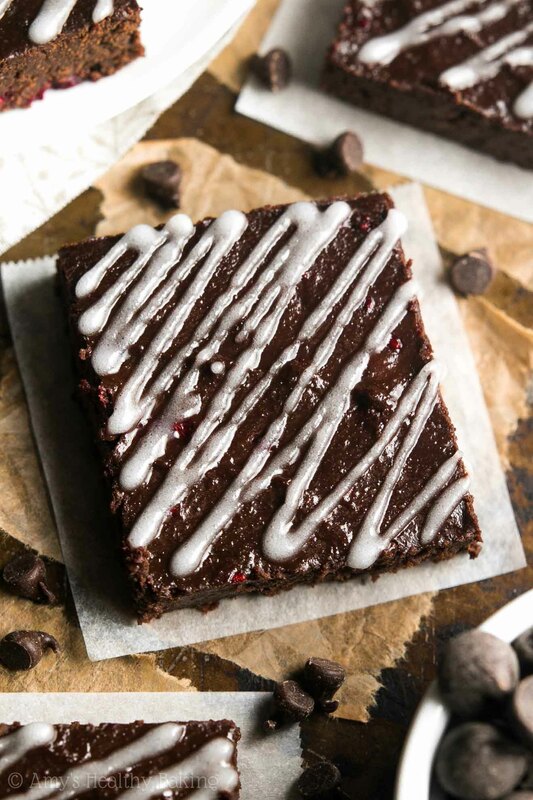 I’d love to see your brownies and feature them in my Sunday Spotlight series! 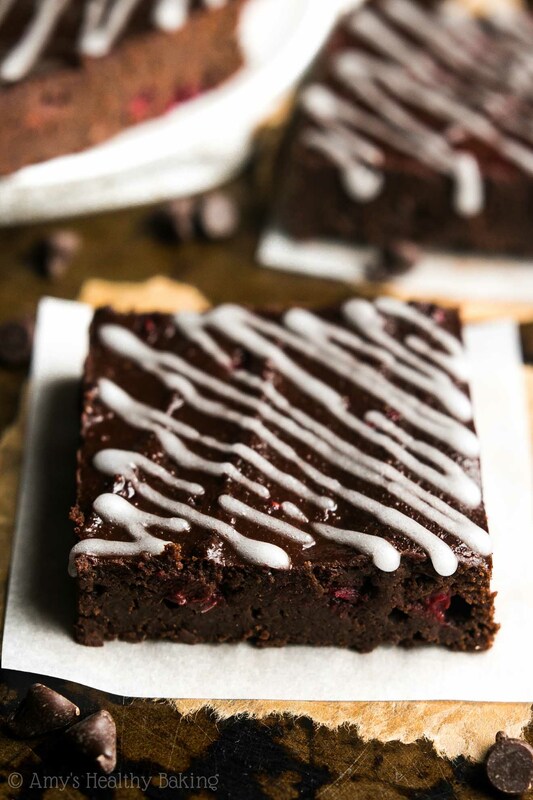 These fudgy brownies are so decadent and rich! They taste similar to 72% dark chocolate, and they’re perfect for Valentine’s Day. Leftovers will stay fresh for at least 5 days if stored in an airtight container in the refrigerator. 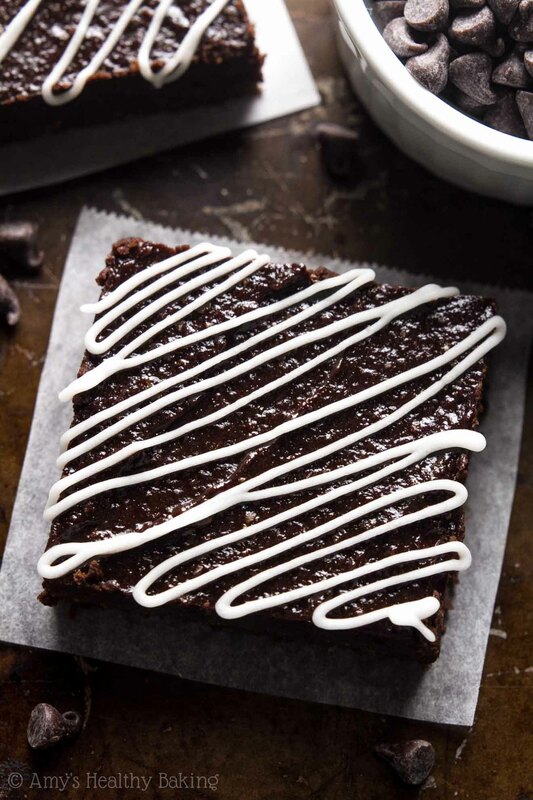 Wait to drizzle the brownies until just before serving, even the leftover ones, because the drizzle will “melt” on top of any leftover brownies that are sealed inside of that airtight container. Just before serving, prepare the drizzle. 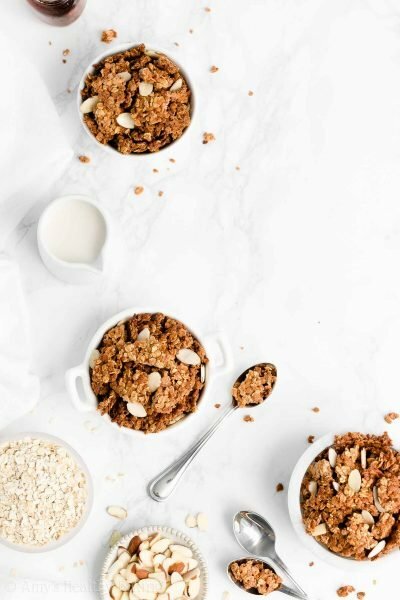 Mix together the stevia, milk, and almond extract in a small bowl. Transfer to a small zip-topped bag, cut off a tiny piece of one corner, and drizzle on top of the cooled brownies. 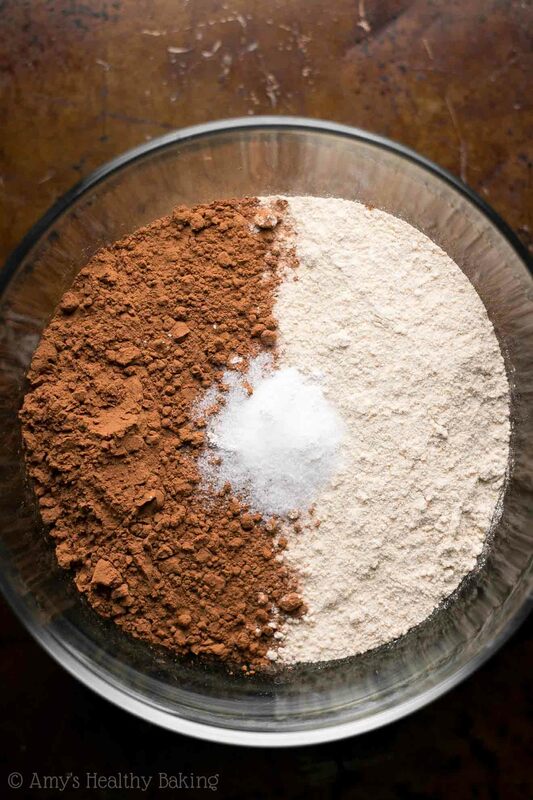 Notes: For the gluten-free flour, use as follows: ½ cup (60g) millet flour, 2 tablespoons (15g) brown rice flour, 2 tablespoons (15g) tapioca flour, and ½ teaspoon xanthan gum. Most store-bought gluten-free flour blends will work as well, if measured like this. Honey or agave may be substituted in place of the maple syrup. Alternatively, ½ cup of brown sugar plus ¼ cup of milk may be used instead. 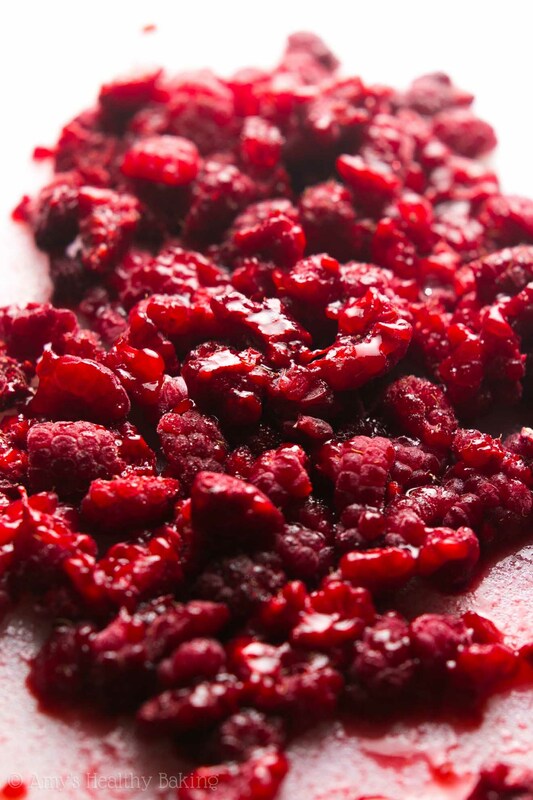 The baking time will depend on how much your raspberries have thawed. If they’ve barely thawed when you mix them into the batter, the baking time may increase by as much as 5 minutes. They’re ready to come out of the oven when the sides look mostly done and the center still looks glossy. That center will continue to cook through as the brownies cool in the warm pan. Fresh raspberries may be substituted for the frozen. The baking time should remain the same as listed in the Instructions above. Vanilla extract may be substituted for the almond extract in the glaze. I just need to get an appropriately sized pan for the next time I make these because mine is waay to big so they came out a little unevenly thick but it didn’t change the taste at all. I’m so glad you and your boyfriend enjoyed the brownies Elina! That means so much to me that you made them for such a special occasion. I’m honored! 🙂 And thank you so much for your kind words about my recipes too! ♡ As an ex-chemist, I actually prefer measuring with a kitchen scale over using cups, even thought I’m in the US. I’m just odd like that! 😉 I’m happy you find that useful as well! Hi! 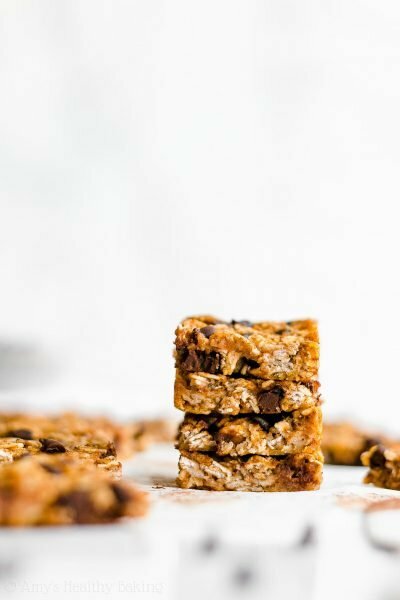 Can I use regular whole wheat flour for this recipe? What is the conversion ratio? Thanks! Yes, regular whole wheat flour will work as a 1-to-1 substitute, although the brownies will have a slight “wheat-y” flavor. 🙂 I can’t wait to hear what you think of these brownies Amanda! Can nonfat Greek yogurt be replaced by 2% Greek yogurt or non-Greek 0% yogurt? Yes, either option will work! 🙂 I can’t wait to hear what you think of these brownies Sophie! Hi Amy! I notice you use this basic brownie recipe for most of your fudgy brownie variants (90g flour, 60g cocoa powder, 28g butter, 60g yoghurt, 2 eggs, 120ml honey/agave/maple syrup). Could you advise me how to tweak this for my cakey-brownie loving friends? Something along the lines of your midnight brownie texture 🙂 (which I really love). I tried following your ratio above, and baked them for longer, but the brownies just end up slightly harder. Could I perhaps increase the flour to 100g, sub the 2 eggs with one egg + one egg white, use granulated sugar instead of honey? Would I get to the midnight brownie texture? Do I need to turn up the oven to 350? Thanks!! 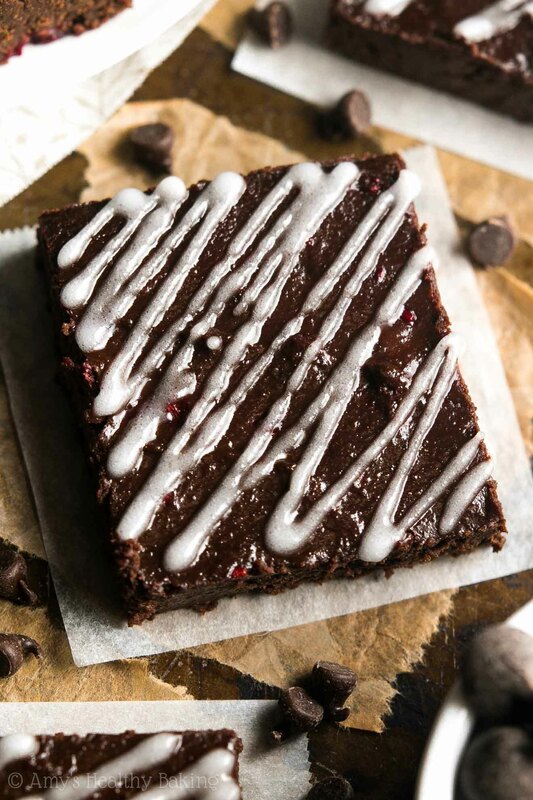 Made these brownies last night with gluten free flour (store bought flour blend) using agave and organic cacao powder and it’s seriously yummy and indulgent! 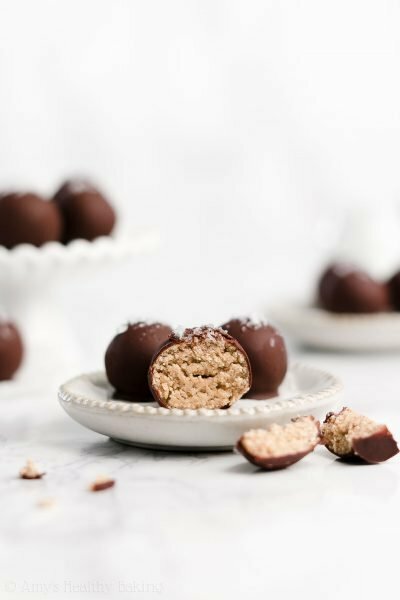 My cravings for chocolates are very satisfied…great recipe!